Saints star Tom Wood is disappointed that he won’t get to face England team-mate Chris Robshaw at Twickenham this weekend. arlequins captain Robshaw has been ruled out of the Aviva Premiership encounter with a shoulder injury. And that will boost Saints, who are desperate to win the battle of the forwards as they seek to stay top of the table. But Wood was eager to take on Robshaw and has wished the influential star a speedy recovery. “Chris is a quality player,” said the Saints flanker. “The likes of Calum (Clark) and myself were actually looking forward to playing against Chris. “We’re all England rivals, all been in the camp together and we relish those opportunities and challenges. And on the challenge posed by a Quins side who have won half of their 10 Premiership matches this season, Wood added: “They’re a quality outfit whoever they pick. “They’ll have Nick Easter back this week, Jack Clifford playing well. They’ll come out all guns blazing. 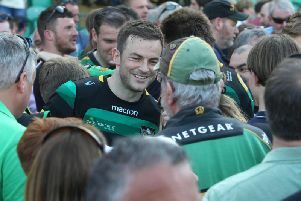 Saturday’s showdown will see Saints return to Twickenham for the first time since they won the Premiership title there in May. And Wood is relishing the chance to get back on the hallowed turf in front of what is expected to be a capacity crowd. “It’s a real luxury to be able to play in front of that many people in a club game, particularly around Christmas,” he said. “We’ve got a lot of internationals in our team who will have experienced big crowds before but to do it in your club’s colours in something we’re really excited about.